My life has drastically changed in the last year. Last summer I was 100% in the zone with running and being at what I thought was the “perfect weight” with my “perfect body.” Sure, I LOOOOOOVED how I looked and I felt amazing, but in order for me to maintain that body/weight, the pressure was and would be pretty great and demanding. I just don’t have the time or motivation right now to attempt to maintain that standard. Maybe after I’ve paid off a good chunk of my debt and am no longer working 64 hour work weeks most weeks, then I can refocus and work on upping my motivation to better my physical self. Right now, I’m about 35 pounds heavier than I was this time last year. I have to say that I’m about 85% okay with that fact. Why? Because other than my finances and that I haven’t worked out beyond walking a couple times a day in almost a month now, things are going fantastic in my life. I’ve been focusing a lot on costume making lately. So far I’ve made 2 pirate jackets. Why 2? Well, you see, what happened was…and I want to preface this by saying that your actual clothing size does not determine what size you should buy your sewing patterns in. Needless to say, I wear anywhere from an 8 to a 12 in regular clothes, but apparently in sewing patterns I wear a 16 to 18. This was rather frustrating to discover AFTER I’d already completed jacket #1. I put it on and while it was a smidge tight in the breast area, it was comfortable. Then I took it off and happened to look at the seams down the back of the jacket and the fabric (which is NOT a stretchy fabric) was stretching. NO BUENO! So I have decided that until I lose weight again, I cannot wear that jacket again. Sooooo, I made a second jacket and this one fits. It’s actually a teensy bit big, but not by much. it’s very comfortable and looks fantastic. I’ll be making a 3rd jacket before the big trip to the Texas Renaissance Festival over Thanksgiving weekend with a large group of old and new friends. 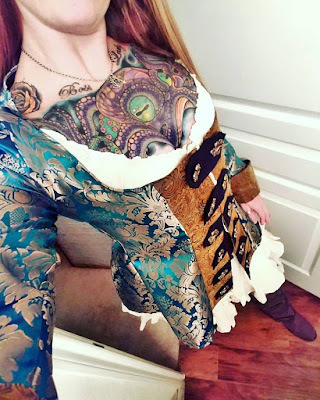 But, first I need to take a small break from pirate jackets. Both jackets I’ve made so far were frustrating for separate reasons. I’m pretty sure that jacket #3 will go a lot smoother, but I still need to take a breather. So what’s up next? An elf huntress costume, of course! 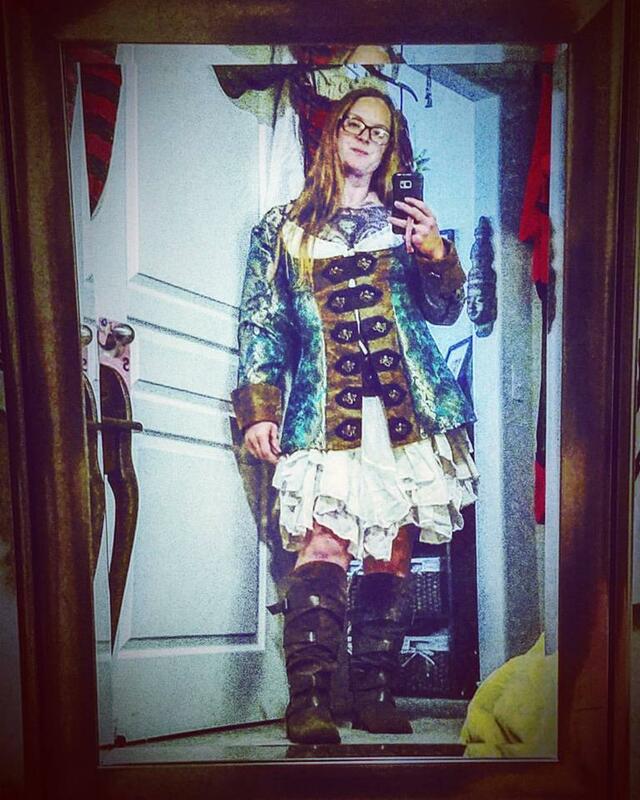 This costume isn’t going to be worn until the Sherwood Forest Faire in next spring. 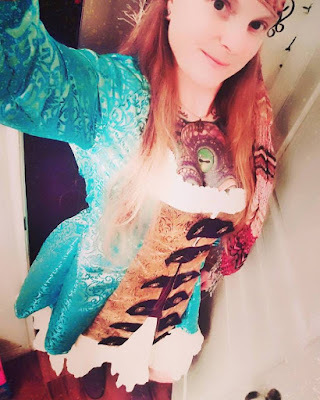 However I do want to get a jump on it and get the sewing done then I can focus on doing the purchasing of the commercial items that will accompany my wearing of it. My elf huntress costume will basically be my Linken costume. In case you’re not familiar with Linken, let me just give you the short story: Linken is a female Link (from Legend of Zelda). That’s it. My commercial purchases for this costume will be Link’s shield and a dozen arrows with green fletching. I already have a Link’s sword. I will make a baldric that goes cross-chest to hold the sword. 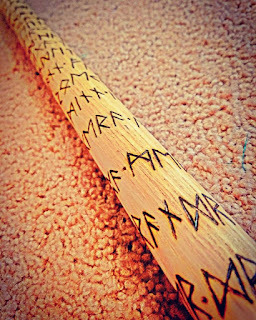 And I’ll make my own quiver. And then I’ll just use the belt and pouch I’ve already made for my Viking costume. 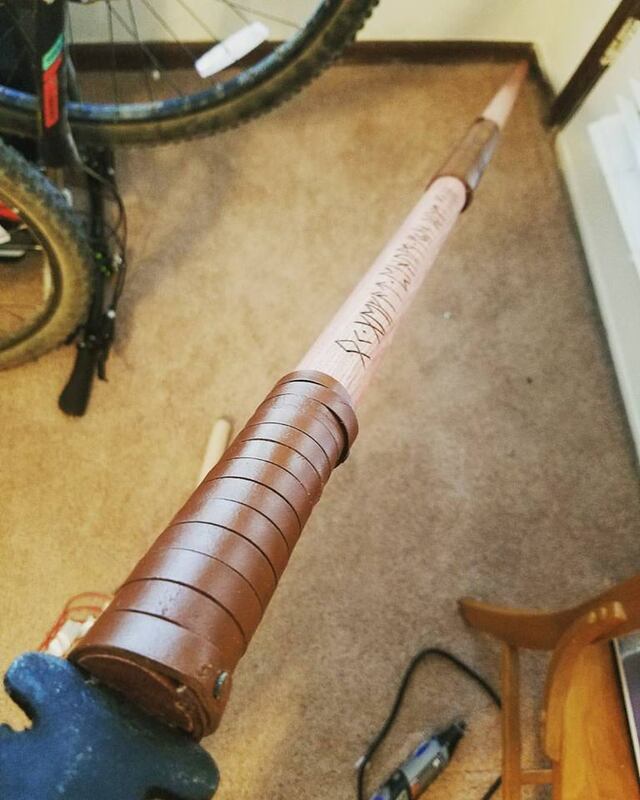 The quiver will hang off my belt. I’ve also been doing some pyrographing. 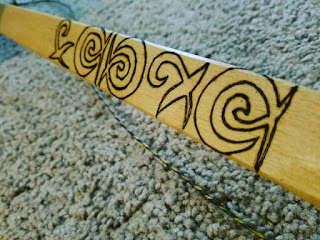 What is pyrographing, some of you might be asking, I’m sure. Basically, it’s just a fancy word for burning designs into wood. 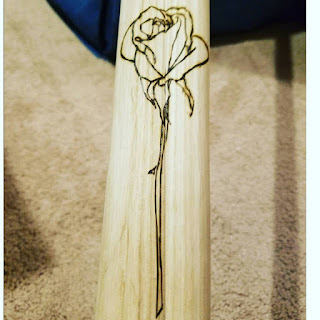 I pyrographed a few quotes onto my Viking spear, along with a rose as well. Then I pyrographed the Futhark runes into wooden discs to make a set of casting runes. And most recently, I pyrographed my long bow! I had quite a bit of fun with this. 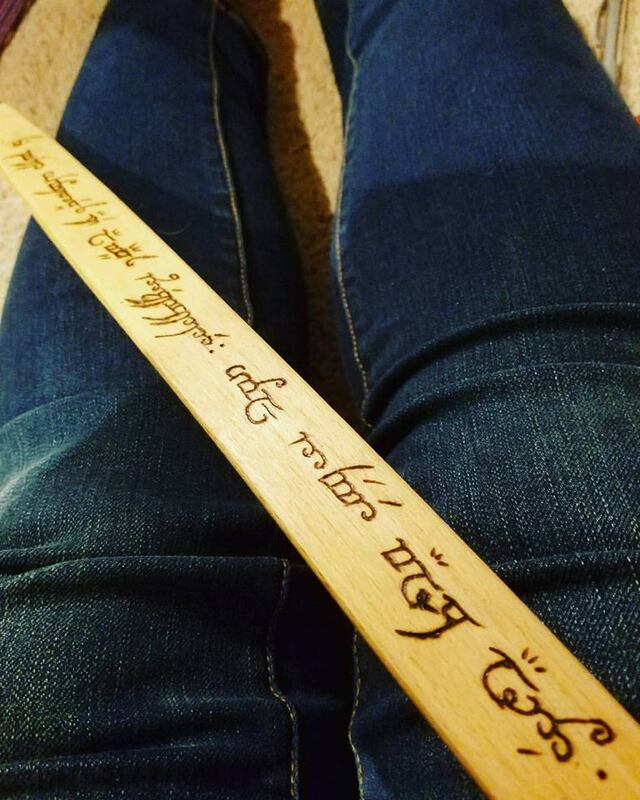 I burned the symbol for the “unfound” from Stephen King’s The Dark Tower series twice onto the spine of the bow, above and below the grip area. Then…and here’s the actual fun part…I chose some quotes in J.R.R. Tolkien’s elvish language and then burned them onto the bow. 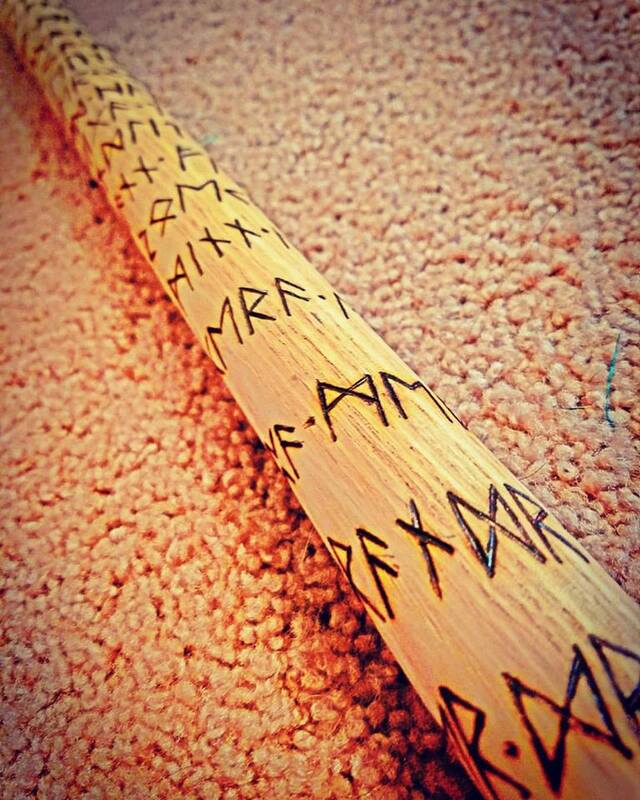 It turned out amazing and I’m quite happy with it! 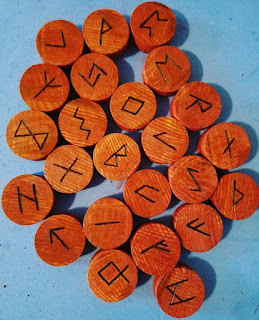 my set of casting runes! I recently got a new eye exam and an updated prescription. And let me tell you, I’m going to see much better once my the new lenses for my glasses come in. They had to special order them because I had to be fancy and want the photochromatic, anti-glare, scratch resistant lenses and they didn’t have them in stock at the store. I bought some frames off the internet from Zenni Optical. (I highly recommend them, but would probably advise you order them with your prescription already in them from Zenni and not take them to a local shop because it’s more expensive…I’ll be doing that next time) I bought a pair of sport sunglasses for running and biking. And I bought a pair of regular, daily wear glasses. The sunglasses came with tinted, mirrored lenses and it had little inserts for the prescription lenses. Well, the prescription lenses are also tinted and polarized too. I’ve always been frustrated because I cannot find sunglasses that are dark enough for my preference. I have very blue eyes and they are rather light sensitive. Well, these sunglasses are PERFECT! On top of getting an updated prescription, I got fitted for contact lenses. I have absolutely no intention of wearing them frequently. In fact, a 90-count box will most likely last me at least a year, if not longer. I want them pretty much exclusively for when I’m in my costumes. Because, you know, who ever heard of a Viking or a pirate or a barbarian wearing glasses? I have a follow up appointment with the eye doctor later this week so I can report back with my thoughts about the contacts and then order that 90-count box. I will say this about the contacts. I’m used to glasses and varying levels of correction and also going between looking thru the lenses of my glasses and above/below them at whatever I’m looking at. So the fact that I had complete correction no matter what direction my eyeballs are pointed is a little disorienting. 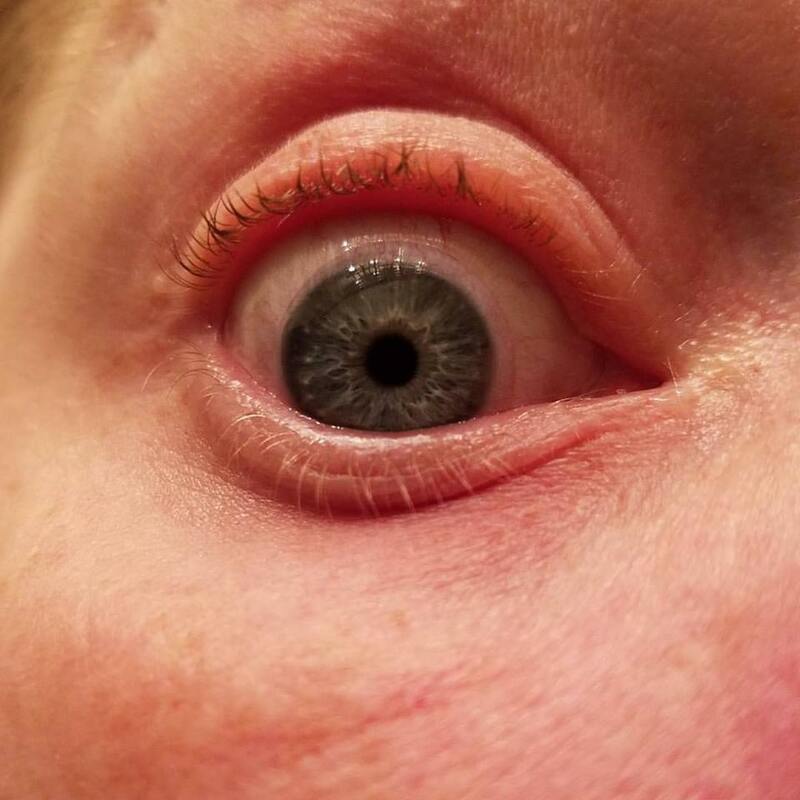 I don’t know how to describe it, other than it just gives a weird sensation sorta like extremely mild vertigo, mostly when I point my eyes in a direction that would normally be above/below the lenses of my glasses. But it’s something I will get used to and it’s a very mild affect, so it doesn’t SUPER bother me. Right now it takes me a few minutes to get them in and to get them out, but I know that time will improve with practice. I do want to get some colored contacts in grey. might be hard to see, but there is a contact lens in there!